Right to Information Act, 2013 was enacted, joining the list of progressive second generation information laws in Pakistan. As the implementation of these two provincial laws began, right to information, RTI advocated continued to work for similar legislation in the Sindh and Balochistan province and at the Federal level. After three years of continued efforts, the Sindh Assembly also passed the Sindh Transparency and Right to Information Bill in March 2016. The advocacy for improved RTI legislation at the Federal level and for Balochistan province continues. At the time of this publication, the country enjoys three strong provincial RTI laws and and operational federal RTI law. However, even as the information regime has opened up, the uptake of the in law has been dismal. The media fraternity that can benefit tremendously from this set of laws has been particularly lacking in taking advantage of this new regime of information laws. 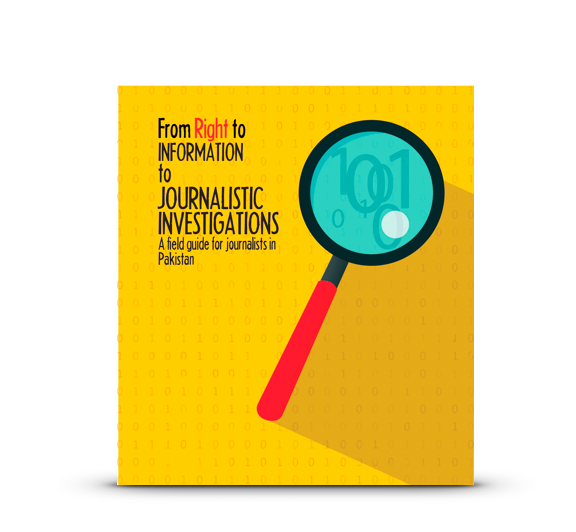 This guide seeks to present the RTI laws in Pakistan as a tool of investigative journalism and explores the opportunities and challenges in the utilization of these laws as a source of journalistic information.